Located in the city of Antipolo, Philippines, Soup of the Day provides integrative health, wellness, productivity and disease prevention programs, applying the education from the best and largest nutrition school in the world based in New York City, USA Institute for Integrative Nutrition. We tailor wellness programs to meet our clients' individual needs. We are the only well-being provider integrating all the different dietary theories—combining the knowledge of traditional philosophies with modern concepts like the food pyramid, the glycemic index, the Zone and raw foods as we help co-create a supportive healthy environment at HOME, SCHOOL, WORKPLACE and COMMUNITY. Soup of the Day is one of the nation's leading integrative wellness program consultants serving wide variety of clients for their integrative wellness program. Our signature SELF PSCENsR is your jumpstart and companion tool towards enjoying your healthy living journey you can use online or onhand. Our innate being has two major category attribute; inherent and coherent. Our inherent attributes are: spiritual,nutritional,physical,emotional and legacy. Our coherent attributes are: religion,financial,environmental,social and career. Each attribute makes our star based on our own assessment. 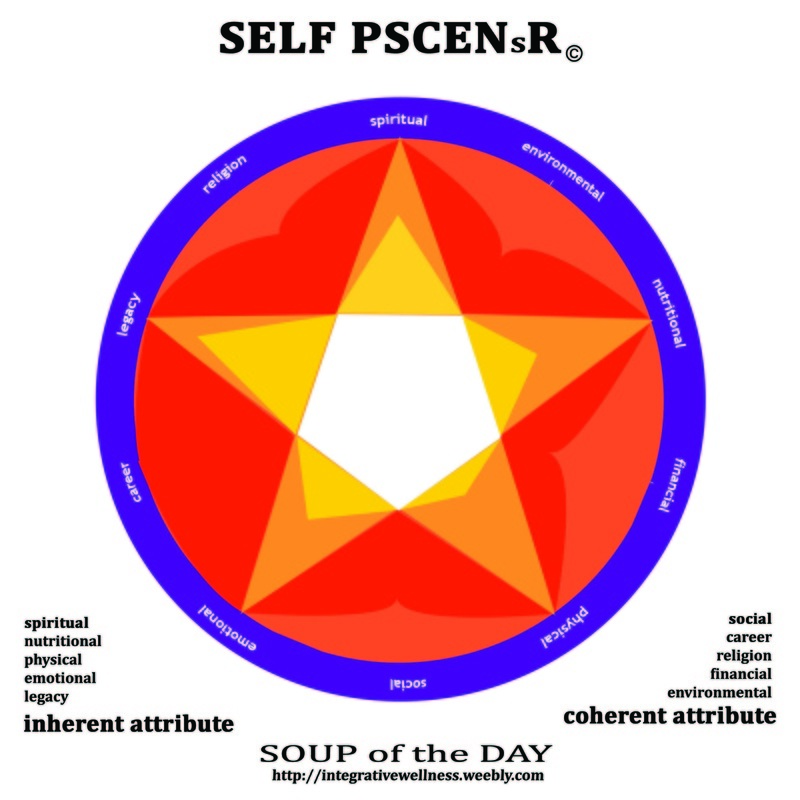 The image on the upper left shows the image of our state of well-being with the coherent and inherent attributes illustrated. This is our SELF PSCENsR tool. Start assessing your Life STAR and see how it looks. The process will help you receive new insights and be able to tune in to the areas of your life needing reinforcement. This is your weapon in your journey to your well-being state. Always remember that your Life STAR is your responsibility. 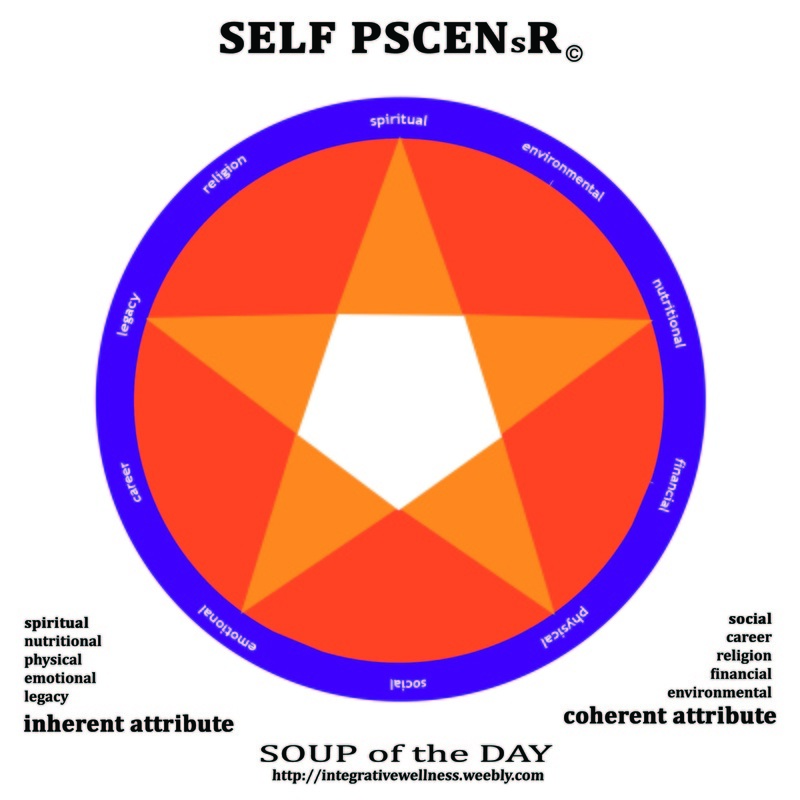 Download and Print the SELF PSCENsR. Print and assess your lifeSTAR now or you may go to www.wellness4one.com and have your assessment online for FREE by December 2011. REMINDER: If you have health concern/s, it is recommended to consult with your physician before doing the breathing exercise. You may proceed assessing your lifeSTAR without doing the breathing technique if you were advised not to do the breathing exercise. Tune in to your innate being by doing this breathing exercise. Sit erect on the chair, the sole of your feet touching the floor. Breathe in to your nose following the breath in a wavelike motion bringing your shoulder slightly backwards as your chest and belly expands. Counting 1-5 breathe in the chest then 6-10 holding your breath expanding your belly. Exhale through you mouth squeezing the air in your belly through a wavelike motion expelling the air out, bringing your chest and shoulders slightly inward. Do it twice and you should be all set feeling relaxed and focused. Your star can easily show which area/s of your life needs support and the most significant step is the acknowledgement phase. You can reach out or find some empowering information at www.wellness4one.com by December 2011, the lifeSTAR assessment tool is incorporated in the system and you can use it anytime you like. This is our tool gift towards reclaiming our perfect STAR! Use it or FREE and share it with your friends. Share this activity. Do this with your family, friends, officemates and establish community support. Could one conversation bring wellness to your self, home, workplace or community? Contact us now for a free consultation to discuss your unique situation and determine how we can help you reach your goals! We are here to co-create a supportive environment while we explore what works for you. Email us at integrativewellbeing@gmail.com or CALL 632.5867457 ; +639178546851 ; +639229661395. Let us help together in co-creating the world of healthy people.